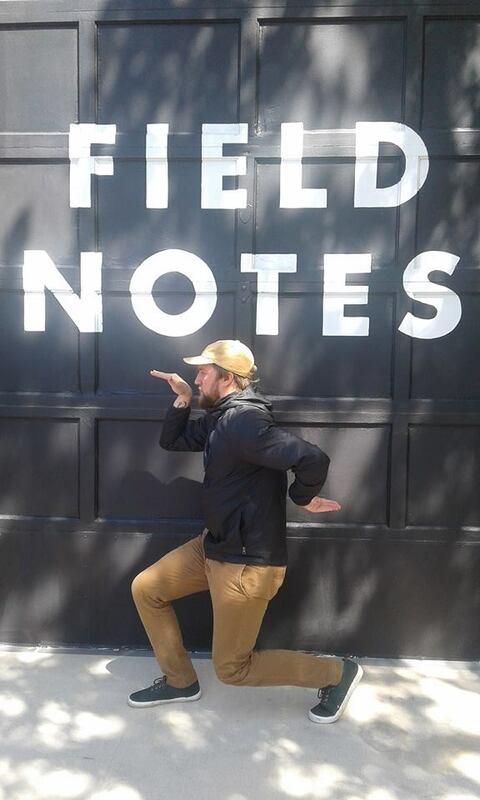 On Saturday May 6th, 2017 I payed a first time visit to the Field Notes Midwest HQ in Chicago. The brand headquarters opened its doors for the day and invited all to come enjoy the new space. I have known the notebook brand for a few years now and I couldn't pass up the opportunity to familiarize myself with it even more. Creator and lead designer Aaron Draplin was present: answering questions and fronting a small line of customers who waited to have their products signed. A full table of merchandise by DDC, "Draplin Design Co." was open for business so I made sure to snag a handful of stickers to add to my collection. An array of Field Notes were available for purchase at the small storefront as well. On display were both limited/special editions and the classic brown or black cover Field Note three packs. I personally snagged a black three pack, as I always keep one in my pocket for jotting down reminders and releasing miscellaneous mind contents. While admiring my recent purchase in the small shop area I was fortunate enough to meet co-founder Jim Coudal and share a few words too. I wasn't familiar with Coudal or his role in Field Notes prior to my visit so it was definitely a cool run in. Founders Aaron Draplin and Jim Coudal have managed to make the notebook a thing to be collected and sought after. A Field Note book's simplicity and functionality brings the type of punch that leads me to think, "this is the type of product I could stick with forever." I have no doubt I am not alone in this proclamation either. The brand has built a following of loyal fans and customers, who through the "Field Notes Subscription Program", can exclusively receive specially released notebooks throughout the year. The small pocket-sized books come in a range of choices, but all stay true to the form and function of the originals that Draplin produced by hand. His initial intent for the books was to make a batch to give to his peers, as a sort of usable business card with a two-fold purpose. However, once one of Draplin's original hand crafted Field Note books caught the eye of fellow designer Jim Coudal...the minds met and the rest is history. You can get the full lowdown on the man, the brand, and purchase DDC/Field Notes goods from the links below.